Vanasthali Public Sr.Sec. 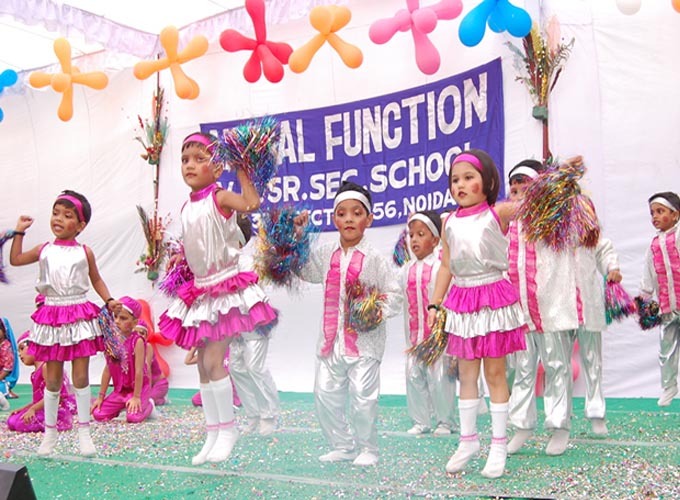 School Noida celebrates its annual day in the school premise. During last celebration the whole atmosphere was enveloped with fragrance of flowers. Mr. Sunil Jain was the chief guest. The chief guest lighted the lamp. A tribute to goddess Saraswati marked the beginning of the programme. Principal Mrs. Kum Kum Dutt read the school report, highlighting the achievements of the school in all spheres i.e. - academic, sports and cultural activities. After this, a colorful cultural program started with welcome song by junior wing. The highlight of the evening was dance and drama presented by the students of all classes. Blooming buds of VPS presented "Jai Ho" and the girls performed an excellent umbrella dance. Thus, the programme was followed by Shadow dance, Bhangra and the dance depicting bollywood personalities. The current issue of terrorism was depicted in the form of a play. In the end, the chief guest appreciated and blessed the students. He also encouraged the students and teachers to take the school to greater heights of glory. Afterwards, he distributed prizes to meritorious students as well as to the teachers. The event ended with a vote of thanks by Principal followed by the national anthem.